Many teenagers and adults know at least one person who has been involved with some sort of occult practice, whether it be reading horoscopes or being interested in astrology. A Barna Group survey reveals that nearly 75% of all U.S. teens have dabbled in some form of psychic activity or witchcraft. Christianity, Cults, and the Occult, a pamphlet that can be read in 30 minutes or less, takes a close look at eleven cultic movements that have a wide range of occult connections and compares them to the origins and key beliefs of Christianity. 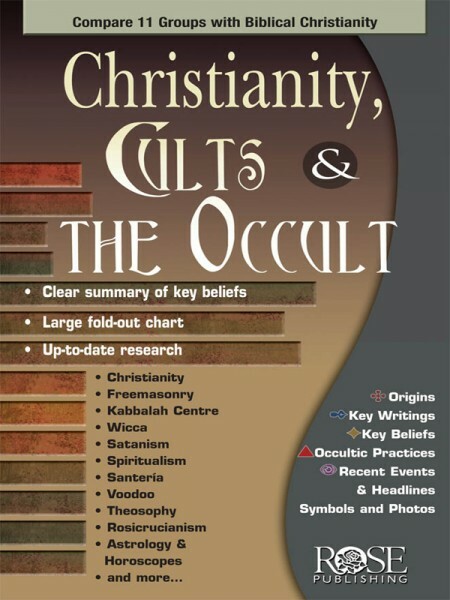 Christianity, Cults, and the Occult helps Christians understand their own beliefs and explains the backgrounds of different occults, a list of occult terms and definitions, as well as Scriptural warnings against the occult. People enjoy discussing this topic and the pamphlet will equip them to know how to deal with the occult when it confronts them in their schools or neighborhoods. Christianity, Cults, and the Occult explains why people are attracted to occult groups like Kabbalah which include people like Madonna and Demi Moore. More than ever, you need clear, reliable information so you can speak intelligently when talking about your Christian beliefs. Christianity, Cults, and the Occult provides you with information that will help you understand, pray for, and offer help to others who are interested in the occult.